Dear WholeMom: My 11-year-old son loves to read, work on the computer and paint, but he can't sit still in school. We've received five notes from his teachers this year and it's only December! We've had him tested. He has a high I.Q. and does not have A.D.D. (Attention Deficit Disorder), so we know that he does not have a concentration problem and is not hyperactive. He can walk into a test after he has studied the material and knows it cold, but he'll just sit and draw pictures on the test paper. Q Dear WholeMom, Ever since my first daughter was born there was such a special way about her. She was different. I was delighted by her every move. I knew in my heart that she was gifted. By the time she was two, my sister and other relatives and professionals would comment to me about how wonderful she was. When she toilet trained herself, learned her colors, numbers, ABC's, and words to more than 30 songs by the age of two, I simply beamed with joy over her accomplishments. She longed to do things and go places. She was a sponge for information and experiences. 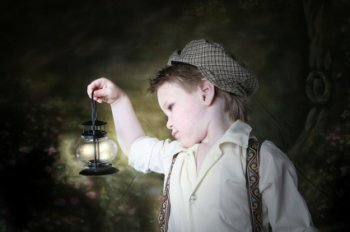 We did not need an official testing process to reveal to us what we knew from the time that our son was very young - that he was a gifted child who was not only precocious in his reading and other cognitive abilities, but whose mind worked in totally different ways from the minds of ordinary children. He was tested at the age of five at the urging of his two pre-school teachers who wanted to advance him to first grade after only one month in kindergarten. Dear Linda, Our son, David, is 13. Until fourth grade he was a quiet kid who sat in the corner and read books. During the fourth grade a slow deterioration began in his school behavior. A psychologist told us he was understimulated and getting bored. We tried to help him hang in there a few more years. There is no gifted kids program in our area. We finally decided to partially homeschool him and have been doing so for the past two months. Now that he spends more time studying on his own than in school, he has become a much happier boy, and, ironically, his social relationships have actually improved.